When folks think whiskey, they think Tennessee or Kentucky. But the story of American Whiskey began in Pennsylvania, where Kinsey was born in the 19th century. Kinsey is a homage to our original distillery along the Schuylkill River, which once held the world’s largest collection of aging whiskeys. This 10-year whiskey is our interpretation of one of those classic Pennsylvania Whiskeys, made from 100% corn and aged in oak. 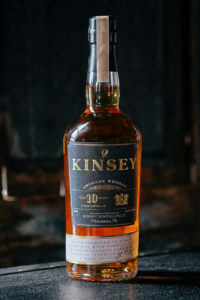 Kinsey American year whiskey opens bright and vibrant on the palate, leading to floral, semi-sweet vanilla notes and finishing with hints of honeycomb and caramel corn.